My name is Gemma Kate Burgess. I've worked within the creative retail industry for fifteen years and I'm currently a freelance stylist/prop designer. 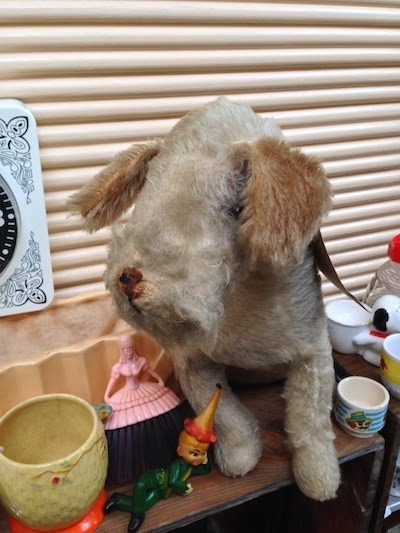 I've attended The Vintage Village since it started and watched it grow in popularity. 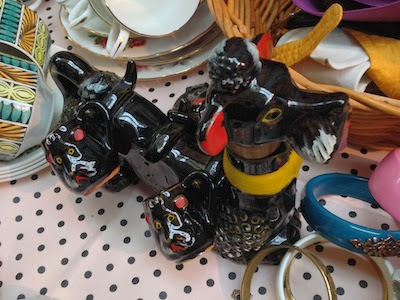 And now I'm very proud to be a part of The Vintage Village next month: I will have a stall at the forthcoming fair on Sunday 9th February - trading as Gem's Bits n Bobs - which will offer a diverse collection of my own thrifty finds. You can find me on Twitter as @Gemkatedesigns and @gemsbitsnbobs and on Instagram. This bright number was found on Raiders Vintage's rails: it was in the sale for £5.00 instead of £10.00 - an absolute bargain at both prices! I have a lot of colourful knitwear in my life and it never fails to make me smile when I wear it. 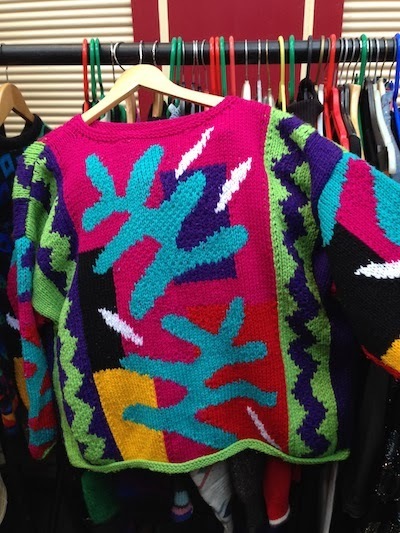 This wouldn't be out of place in the wardrobe of the familiar faces of my childhood; I think Rusty Lee or Floella Benjamin OBE would have wore this bright knit. When spotting this item I gasped and described it as 'awesome' to my Mum. 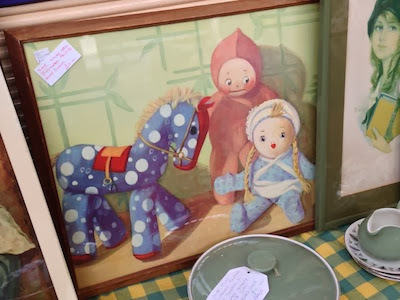 After speaking to the stall owner we couldn't establish a date for this piece as she had researched the item and couldn't find anything like it. The ceramic element is Italian and the actual clock is German. 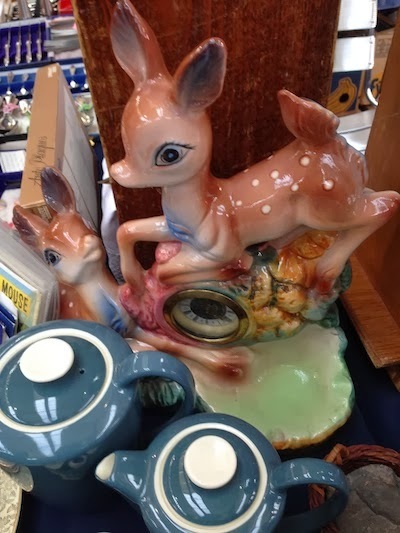 I've bought many items from The Side Room - you can tell that the owners love and cherish every item they sell and take great joy in their wares going to new homes. One of my finds that I purchased! 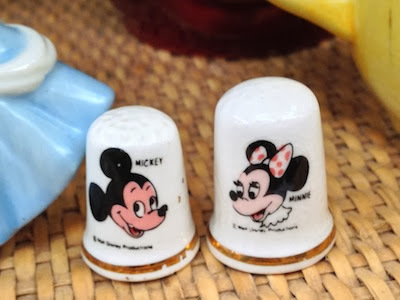 I'm a sucker for vintage Disney, especially my favourite Walt Disney couple Minnie and Mickey. I still dream of one day going to Disneyland. Apparently if you meet any of the characters from Toy Story there and shout "Andy's coming" they have to fall to the ground - my brother James assures me this is a Disney fact. 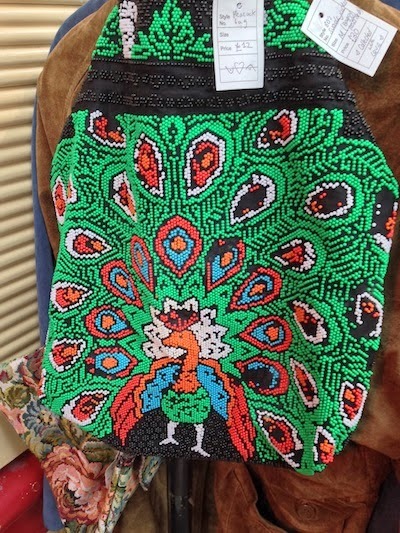 I've got several beaded bags and I thought this one was very Zandra Rhodes-inspired. I also loved the peacock design, which brings back memories of my parents staying in an apartment building in Tenerife called 'El Rinco' (meaning 'on the corner'). It overlooked a privately-owned villa that was guarded by four peacocks you could hear squawking at intruders: the sounds echoed round the mountains. So now whenever I see a peacock I think guard dog. 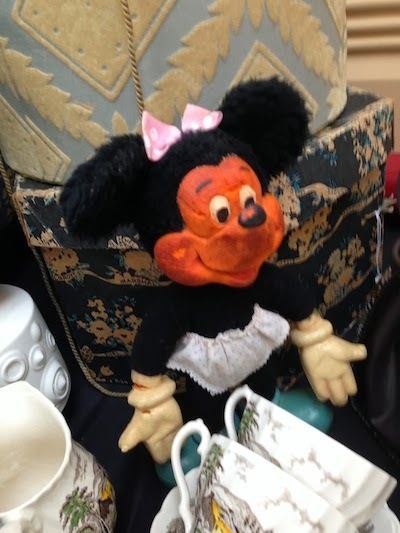 Minnie didn't have her dress, unfortunately, and was very worn but still a great find for vintage Disney collectors like myself. I would make her dresses from vintage fabric, tailoring her a different outfit for each day of the week. 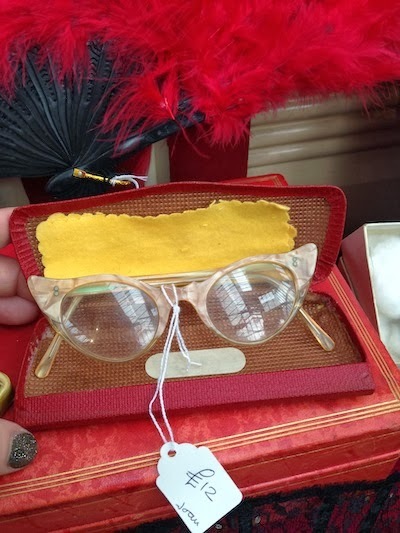 The glasses remind me of the glasses Ros wore in Monsters Inc: "I'm watching you,Wazowski. Always watching". 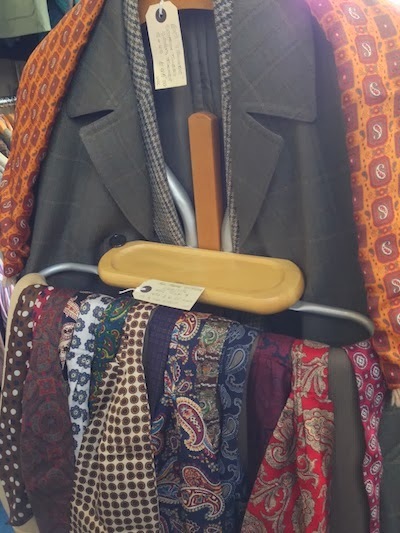 I adore good quality vintage menswear and it's not that easy to find. Spring/Summer 2014 is very much about the masculine, tailored, classic look of a clean crisp white shirt that would certainly be brightened up by anyone of these dandy cravats. 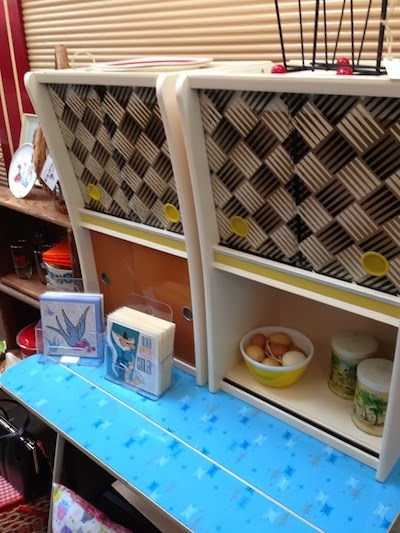 I was drawn to this because of the pattern and the colour, which reminded me of the cabinet in my Nain and Taid's kitchen in South Wales. We were always force fed All Bran for our breakfast, but we did used to go out to the garden and get freshly laid eggs from Henrietta and Mabel (their two chickens). 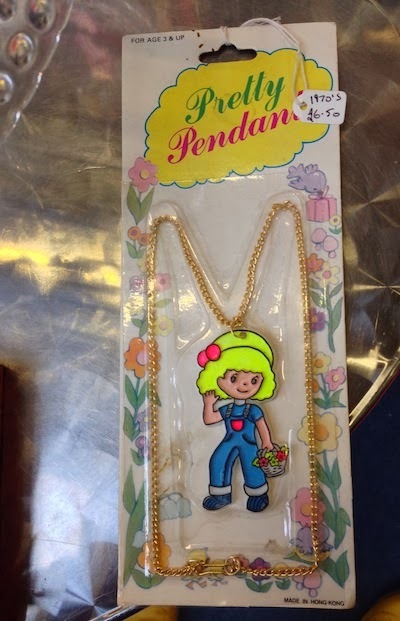 I started at Room at the Top Vintage Goods where I spotted this pretty 1970s children's pendant. It reminds me of all the jewellery that I'm drawn too; it wouldn't be out of place in the East London studio of Tatty Devine owned by Rosie Wolfenden and Harriet Vine, celebrating 15 years as a brand this year. This is American and was bought somewhere in the middle of New Jersey. 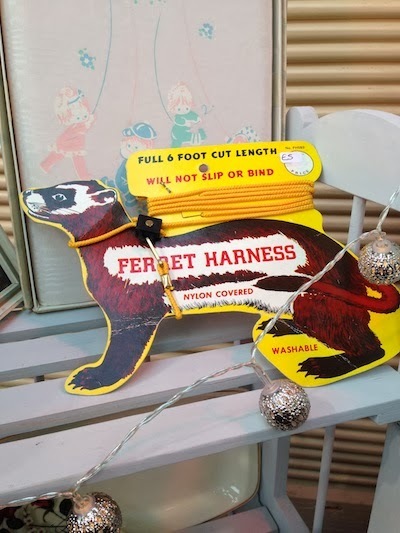 One of the most unusual finds at the fair today but a great gift for a ferret owner none the less. This is Patch. He's 80 years old and a Dean's Rag Book Doll (very rare!) This information was lovingly written and displayed on a brown luggage label around Patch's neck. He reminds me of Stanley, Cath Kidston's family pooch, featured on many of her soft furnishing fabrics and various other products. Patch was displayed on Chris and Gareth Yates' stall. My mum and dad's names are Chris and Gareth too, so when they told me this, it made me chuckle. This beautiful 1980s mohair cardigan is a perfect capsule piece to snuggle up in for the cold spell we're having at the moment. Dress it up or down. Very Dynasty! 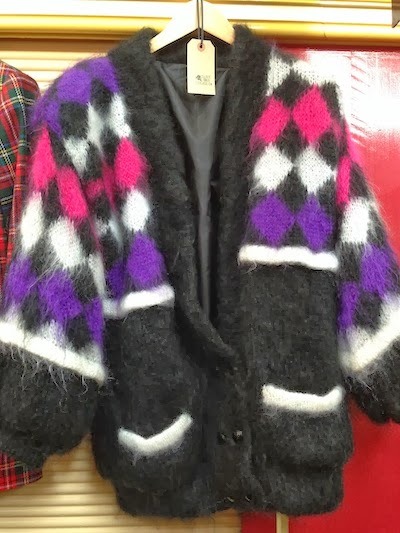 This item reminds me of one of my first ever purchases at the vintage village from Suzy of suzylovesmilo: it was a teal mohair cardigan with with a florescent pink trim - I call it my Muppet cardigan. It was a bargain at £3.00 and the label read " dare to wear" - I dared and won. This was kindly offered to me for a knockdown price of £15.00 (originally £25.00) by Suzy of suzylovesmilo as I had correctly identified it as a 1950s Japanese sake bottle and cups set. 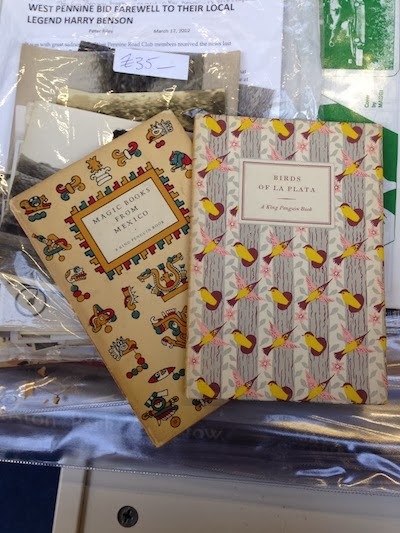 I was drawn to the covers of the books as they remind me of my degree at Stockport College during my textile and surface pattern course. I can really appreciate how difficult it is to create and print a repeat pattern; painstaking but well worth the results. 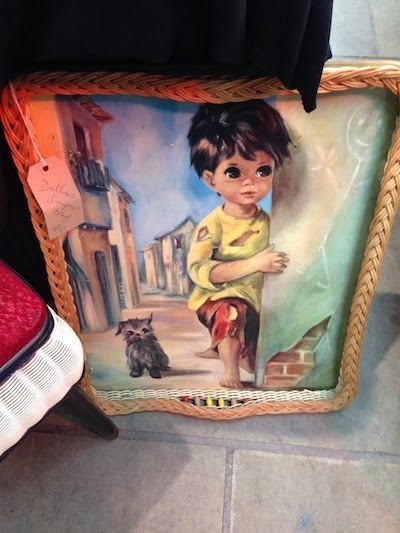 This reminded me of a scene from The Witches by Roald Dahl, when the children are captured in the painting and you can see them moving around the painted scene, ageing before your eyes. Thank you, Gemma Kate, for such a delightful and engaging selection of your highlights of the fair! Let's hope you make it to Disneyland soon!